Part One: Chinatown in Long Potty Island Eight rats survived a tsunami by sailing on a piece of driftwood. When they landed on Long Potty Island (a fictitious island), they found their way to Chinatown of the Island. There, they multiplied and formed a community. 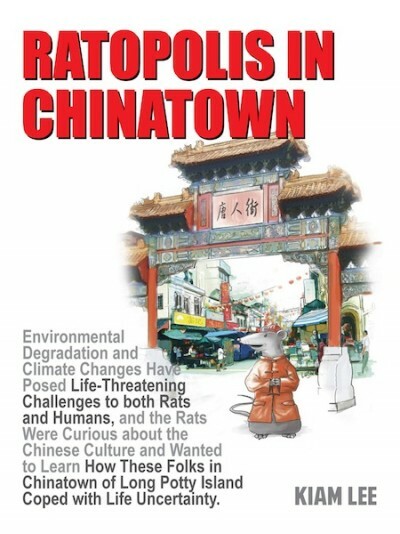 The rats prospered along with the folks in Chinatown, and they began to be impressed with the Chinese culture. Understanding these overseas Chinese, who “drifted” from China due to famine, civil war and natural disasters, had improved life not only for themselves, but also for the natives who lived on the islands adjacent to Long Potty, these rats decided to find out the relationship between the development they observed in Chinatown and the five thousand years of Chinese history and civilization. Koko, the supreme leader of the rat community in Chinatown, retold stories he heard during bedtime from his granny – including the tsunami debacle - to the younger rat generation. The purpose is to strengthen them for the establishment a futuristic Ratopolis—the kingdom of rats. (Half of Part One composed of seven stories told by granny) Part Two: An Orphan Rat Cumo, a rat born with three legs, was pushed out of their nest by his siblings. When his mother found out he was missing in the nest, she tried to save him despite the danger of being caught by a cat. But it was Bao Shan, a boy of 15, who had a speech handicap, saved Cumo and raised him up in a Chinese family. Bao Shan was an orphan himself as he was found by his adopted mother behind a church. Cumo and Bao Shan formed a friendship that traversed beyond the two friends - between two cultures: rat’s and Chinatown’s. Finally, Bao Shan wanted Cumo to return to his compatriots in the rat community. Part Two is a testimony about how Cumo was being saved and raised by Bao Shan. He presented the testimony in a meeting with many rats enthralled by his testimony that was nothing less than a story of resilience and love. Part Three: Rats Planned for Ratopolis In the face of new climate and environmental challenges, the rats wanted to build a strong community for eventuality that could affect their future. With granny’s and ancestral advices, the rats were now ready for a futuristic Ratopolis. Koko, the wise supreme leader, and Cumo, the orphaned rat with a Chinese mentality, guided the convention of rats for the establishment of a progressive Ratopolis. Part Three describes several pros and cons for setting up Ratopolis. + + + About the author: Kiam Lee worked for Christian NGOs for more than 10 years in China in community development and HIV/AIDS prevention. He was originally trained in Entomology and Horticulture and received his M.Div. in 1991 from a Baptist Seminary. Born in Malaysia, he lived among the natives near Mt. Kinabalu in Sabah, northern Borneo, where he met his wife. They have two teenage daughters. In March of 2011, they decided to return to Sabah, Malaysia, to pastor a church. Ratopolis in Chinatown is his first novel.